I came across this photo on Facebook the other day and it rang a bell with me. Here in Lebanon, we even mix 3 languages in a single sentence sometimes. 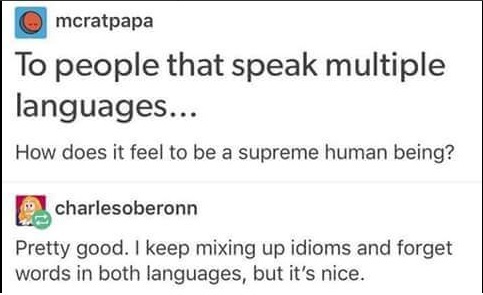 Being bilingual is nice and code-switching comes with the territory. This is the case here in Lebanon (read more about code-switching in this blog post). Fellow bilinguals, or even trilinguals, what are the languages that you speak? I’d love to know so please drop me a comment below! I was born in Egypt – I speak fluently French & English later studied in Israel then speak fluently Hebrew, I also speak some Arabic, also speak eventually Spanish and Italian (mostly when abroad). I use French-English-Hebrew all as mother language. My mother thongues are Haitian Creole and French, I spent more than a decade in Dominican Republic, that’s where I learned Spanish and I also speak English and interprete in all 4 languages. As a native English (U.S.) speaker, I’ve always loved languages but must confess I’ve gotten further with European languages than Middle Eastern ones. Non-English languages I know best — and work with as a translator — are Spanish and Swedish (the latter a heritage language of sorts, since I’m of Swedish descent on my mother’s side). I’ve also dabbled in German, Russian, Italian, Hebrew and Arabic but don’t really know those languages well enough to work with them in a professional capacity. I was born in Mexico. I wento to school there, up to the second year of a four-year university, however, I always liked to listen English. At the Middle School level, my English teacher orresponded with another teacher from Texas at the same grade level I we used to write letters in English to Texan students and they will answered the letters in Spanish. That got me hooked up.